It really is hard to know where to begin with this one. But let's start with: "What on earth were they thinking?" The Heartland Institute, a Chicago-based rightwing thinktank notorious for promoting climate scepticism, has launched quite possibly one of the most ill-judged poster campaigns in the history of ill-judged poster campaigns. 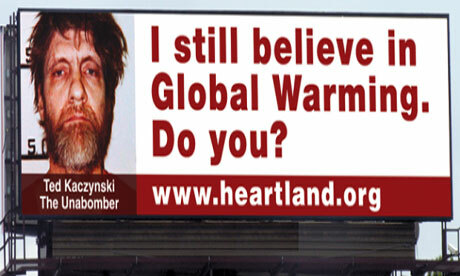 Billboards in Chicago paid for by The Heartland Institute point out that some of the world's most notorious criminals say they "still believe in global warming" – and ask viewers if they do, too…The billboard series features Ted Kaczynski, the infamous Unabomber; Charles Manson, a mass murderer; and Fidel Castro, a tyrant. Other global warming alarmists who may appear on future billboards include Osama bin Laden and James J. Lee (who took hostages inside the headquarters of the Discovery Channel in 2010). - "POL POT ALSO LIKE THIS 'GRAVITY' IDEA. THINK TWICE BEFORE YOU USE THOSE FANCY NEWTONIAN MECHANICS." - "KARL MARX THOUGHT THAT BABIES CAME FROM A MAN'S PEE-PEE. ARE YOU A FREEDOM-HATING COMMIE? (www.heartlandforstorks.org)"
For the record, I've double checked that the campaign and associated evidence were sourced from Heartland's official website and Twitter feed. Barring some extraordinary hack, I think that we're on safe ground in saying that this is legit. So, Bob (Murphy), if you happen to be reading this, I guess my question to you is: Does this "reveal that these people really have no idea how their opponents on the climate issue actually view the world?" Slogans for Heartland was published on May 04, 2012 .